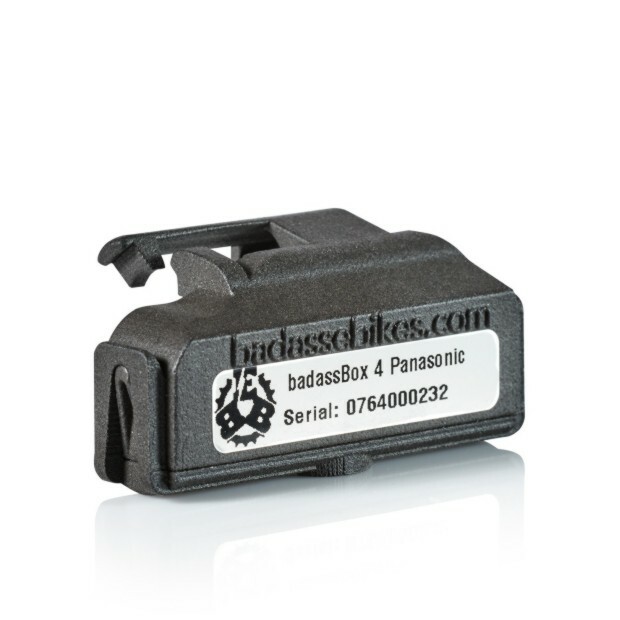 Badass Box 4 for Panasonic Electric Bike Tuning. Removes the speed restriction. Finally the popular Badass Box is available for Panasonic electric bike drive systems, too. With this tried-and-tested tuning tool, you can take away the 25 km/h speed limitation of your Panasonic engine and drive up to 50 km/h with full motor support. You can easily activate the Badass Box 4 by simply plugging the box in and moving the spoke magnet a little bit. If you want to undo the tuning and restore the original riding characteristics of your electric bike, simply remove the box and move the spoke magnet back to its original position. This can be done within seconds. By the way, the badassBox 4 is the best version of this well-known tuning tool so far. New features include, for example, a revised housing and a patented snap lock that enables even quicker attachment and removal. The range of the badass box has also been increased: Thanks to the included 1.5V AAA battery, the range is now over 7,000 km (or 1 year due to battery discharge). 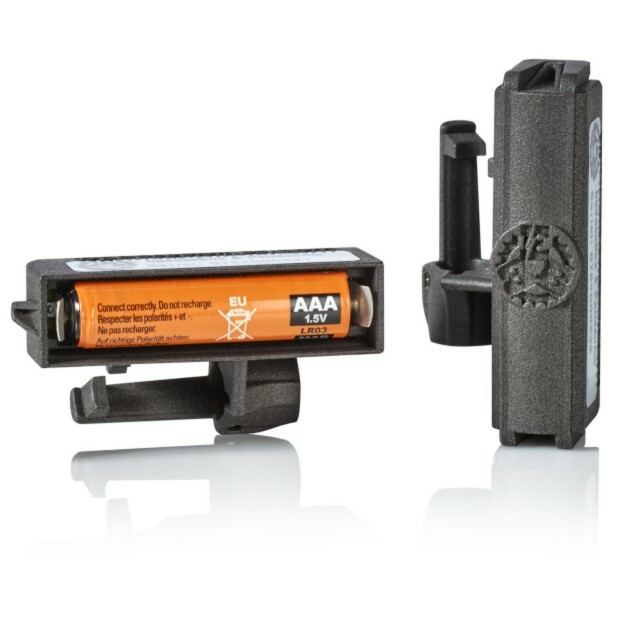 Of course, the battery can be changed without problems – you don´t even need tools to do this. Replacement batteries can be bought cheaply almost everywhere. 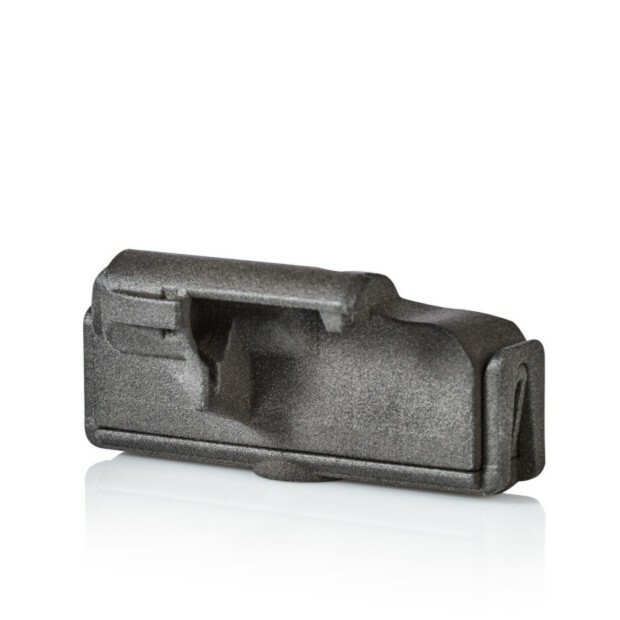 For even better protection against moisture and mechanical stress, the electronics of the Badass Box have now also been glued into the housing and completely sealed with a special casting compound. After insertion, the badass Box transmits a modified signal from the speed sensor so that the 25 km/h speed limitation is removed. This is done contact-free – that means, without any electrical connection to the motor. There is no interference with the motor electronics or software. Therefore, there is no danger that the motor could be damaged. Please pay attention: When the tuning is activated, the current tempo and derived values are no longer displayed correctly. 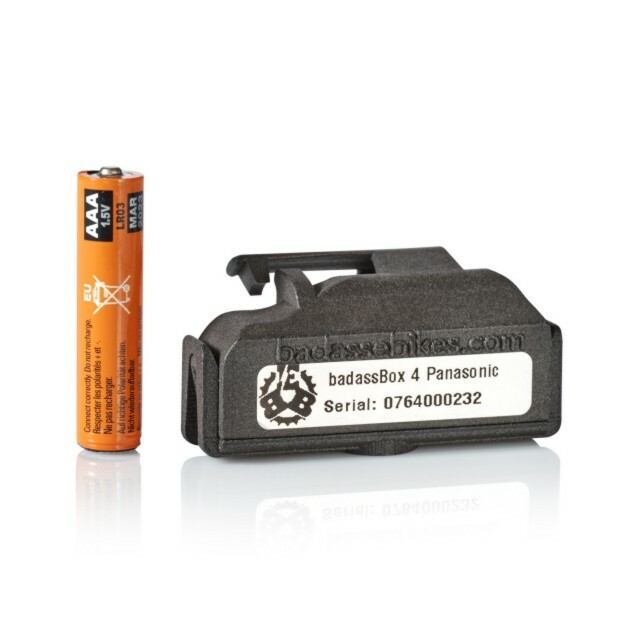 The badass Box 4 is a quality product manufactured and developed in Germany. The installation of the Badass Box 4 is simple and should be no problem even for technical amateurs. It is not necessary to open the engine. You only have to mount the badass Box 4 via the Panasonic speed sensor next to the rear wheel. As soon as the snap lock engages, the box is securely attached to the sensor. We recommend you to replace the spoke magnet screw with the supplied Toolfree screw for tool-free relocation during the first assembly. After the badass box has been mounted on the sensor, the spoke magnet only has to be moved towards the edge of the housing in the direction of the snap lock – that´s all! When you have removed the box, you have to move the spoke magnet back to its original position.